The shop is filled with beautiful wreaths of every size and shape. 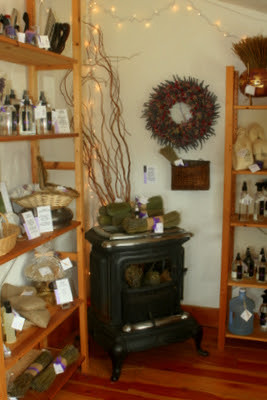 Additionally, lavender essential oils, lotions, potions, and hydrosols fill shop shelves. I splurged on a little jar of lavender scented and purple colored glitter cream. It will sit on my dresser, reminding me of a wonderful day --- but where does one wear fragrant, purple glitter? Especially if you are no longer a teen-ager!